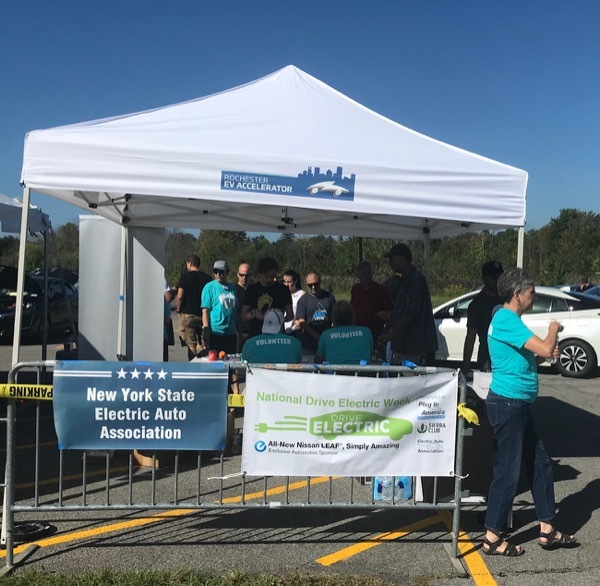 Our local sponsors/partners for the event included the New York State Electric Auto Association (NYSEAA), Greater Rochester Clean Cities (GRCC), Rochester EV Accelerator, and RIT. The Rochester EV Accelerator organization did a great job facilitating the 160 Ride and Drives. Funding for the site use including other expenses was provided by the Rochester EV Accelerator organization and Greater Rochester Clean Cities. This year's Drive Electric Week Event - Rochester NY will be held at the Rochester Institute of Technology (Lot T). The event is FREE. Look for signs as you arrive at the RIT campus. This is the 7th year we have had this event in the Rochester area and appreciate the folks at RIT for being our site host! Our local sponsors/partners for the event include the New York State Electric Auto Association (NYSEAA), Greater Rochester Clean Cities (GRCC), Rochester EV Accelerator, and RIT. *Food will be available (for sale) on site from Effortlessly Healthy, Rochester's #1 food truck! The New York State Electric Automobile Association (NYSEAA) is a Rochester NY based group that advocates for the use electric vehicles and is a great resource of information. The group started as a resource for those building their own EV’s and with the advent of production EV’s we have converted to assisting those that want to buy and drive the new generation of EV’s as well as lending our support to efforts for a larger adoption of electric vehicles. Greater Rochester Clean Cities (GRCC) coalition is part of the U.S. Department of Energy’s Clean Cities program. The objectives of the coalition are to reduce dependency on petroleum and improve air quality through development of fleets of alternative fueled vehicles and supporting infrastructure. The coalition supports a variety of alternative fuels, including EV's, Compressed Natural Gas (CNG) , LPG (propane) and biofuels like E85 and biodiesel, as well as other strategies such as anti-idling and VMT (vehicle miles traveled) reduction. The Rochester EV Accelerator, administered by the Electrification Coalition (EC) in partnership with The City of Rochester, Greater Rochester Clean Cities, and Energetics Incorporated is an innovative, community-wide initiative aimed at achieving widespread deployment of plug-in electric vehicles (EVs). This project is supported by the New York State Energy Research and Development Authority (NYSERDA) as part of the ChargeNY initiative. The EC and partners have been working with public and private sector leaders to provide the necessary infrastructure, educational outreach, coordination, and commitment from local businesses to transform the greater Rochester area into a model EV deployment community. National Drive Electric Week is a collaboration between Plug In America, Sierra Club, and the Electric Auto Association. National sponsors include the Nissan LEAF (exclusive automotive sponsor for NDEW) and ClipperCreek. There are currently 132 attendees registered. Registered attendees report 696,506 electric miles driven.